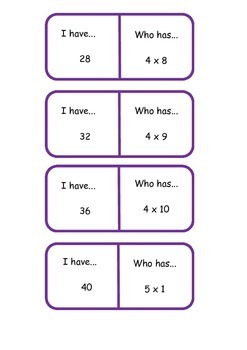 A set of I have, who has cards to consolidate the 1 - 5 times tables. 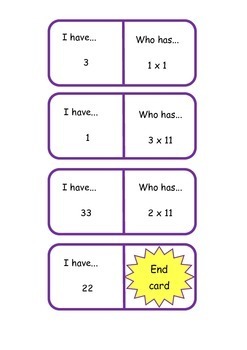 A game for 32 children but adaptable for less by giving children more than one card. Start card reads a sum i.e., Who has 5 X 2. 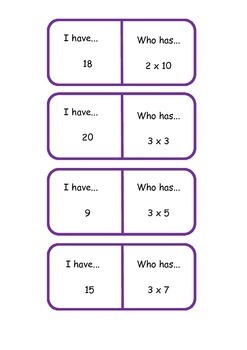 The child with 10 responds saying "I have 10, who has 4 X 5 and so on. A complete circuit back to the start card. 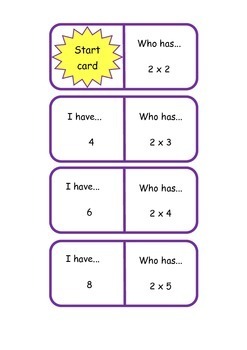 A great game for consolidating or extending the 1 - 5 times tables.